I still have people chase me down to ask questions about the GoC. The most often asked question, ‘Is it still around?’ Well, is Myst Online: Uru Live still around? Which is like asking if OSGrid is still around. OSGrid has 111,948 members with anywhere from none to a couple of hundred online at one time, usually 50 to 100. So, I would say yes, it’s around. We have no idea how many have actually played or are signed up to get access to the Cavern, as Uru Live is called by players. Single new players work their way through the now free to play Uru Live. OSGrid has more concurrent players on a slow day. But Live is still considered live. If no GoC member goes into the game, is the GoC still around? If I answer questions on the forum, is the GoC still around? My now standard answer is sort of. But, certainly not as in the day. I also found that the Maps site I run was broken. (Uru Maps) As security was increased on the parent server something was over looked and none of the images show. Not good for a map site. I’ve been intending to move the site to one of my domains and hosts for a LONG time. Not having that kind of time I changed the security and got it working. Does that qualify as being around? I think my canned answer is about as accurate as it gets for a quick answer. But there is further complication. I still have Myst and Uru Live as my favorite games. I scan the Myst Online forum almost daily (Feedly). But, I am never in the Cavern. Once Cyan caved to the Slackers (hackers) and tolerated having the online game hacked, I and some friends decided the cavern was no longer safe for us. So, we don’t go in very often. I probably haven’t been in the Cavern for a couple of years. There isn’t much to do anyway. As the GoC has always been pretty much a lasse faire group I’ve never encouraged anyone to try and ‘run’ the group and I certainly don’t. I’ll help people and support them, but direction has to come from within each member. The Uru Live Guilds had become a source of drama and aggravation driving many away from the game. Grand Master The Futographer aka Patrick, the first GoC Grand Master was a supportive style leader and Aiden tried to be a motivating leader. Patrick was appointed Grand Master because we needed a file clerk and some office organization more a manager than a leader. Aiden, I think, wanted to be a leader. I doubted he had what we needed to grow the guild. I’ve come to think he saw the GoC as an opportunity to be someone and when that passed and Uru Live closed again he poofed. I could be wrong, but he’s not around and never answered emails so, I can say whatever I want unchallenged. When the Cavern closed and Aiden gave up his leadership in what appeared to be a disillusioned quit rage quite, I hoped to move people interested in GoC toward a freedom oriented guild in what I thought was the intended form by Cyan for player/fan guilds. Have fun, play, and no bosses creating drama. It seems most people want to be told what to do and how to do it and seek out someone to tell them. I personally think this is what governments and schools condition people to think/do as a learned behavior. I find it distasteful. Do your thing and cooperate with others or leave them alone. So, is the GoC still around? In spirit, yes. And I’m around to answer questions and keep the map collection online. If you want someone to tell you what ‘the guild’ is doing, no. It’s like asking what the grass roots people of a nation are doing, no one knows even if someone tries to speak for them. I mostly play in SL and write a SL oriented blog. Obduction, another Cyan Worlds game, is on the way. (Aug 24, 2016 if they don’t delay it again.) I suspect Cyan has made another fun game that includes all the social problems of previous Cyan games. It will be a play and drop type game. I suspect it will be gorgeous as most Cyan games are. They recommend a Nvidia GTX 980 or better to run the game and it will be VR compatible, which I suspect is awesome. Social games like SL, Eve, WoW, GW, and similar ones grow and shrink but survive with 10’s of thousands of players. There is tremendous creativity in the sandbox games; SL, Minecraft… It will be interesting to see what Linden Lab’s Project Sansar turns into. I expect people to build tribute versions of the Cavern in Sansar. I think it will be amazing to put on a VR headset and walk into the Cavern and feel like you are actually in it. 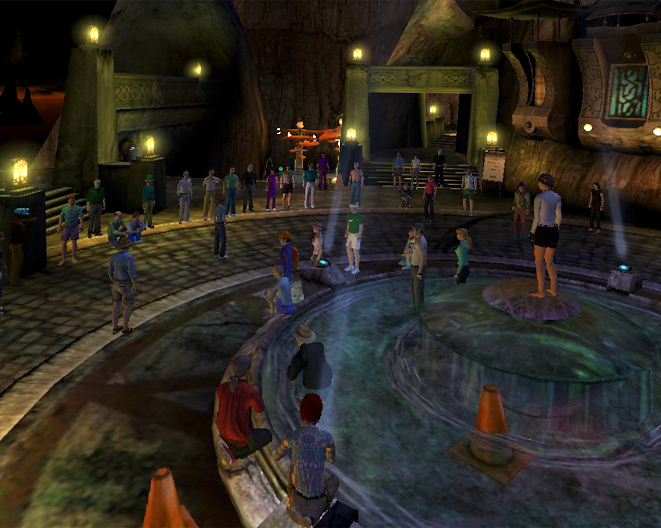 But, Uru fans are still around and most of the old Myst Online Guilds are too. There just isn’t much for them to do. This entry was posted in Myst-Uru and tagged GoC, Myst Uru Guilds. Bookmark the permalink.